RATE ALSO INCLUDES up to 6 dives per week per certified diver!! NOTE: Offer not valid for Christmas, New Years or charters less than 7 nights. If discovering the Bahamas in a unique way is what you're looking for, then "Dream Ketcher" is your answer to a perfect Bahamian dream vacation "off the beaten path". 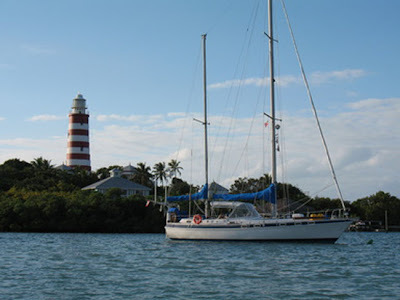 You will enjoying sailing along the scenic Cays with Capt. Eric and be mesmerized by the wonders of the underwater world with Nathalie. Nathalie is the Chef/Mate and is also a licensed PADI Instructor ready to help anyone learn the joys of scuba diving. With over 150 Bahamas dives to her credit, she is the perfect guide to this enchanting undersea world. Newly updated Empty Legs inventory.